Cats love trees. That may explain why they absolutely go crazy for Christmas trees. What’s not to love? You have all the benefits of a regular tree, but you also have ornaments, and lights, and sometimes tasty snacks hanging from the branches. The only thing missing in this feline heaven on earth would be mice running around all over the tree. 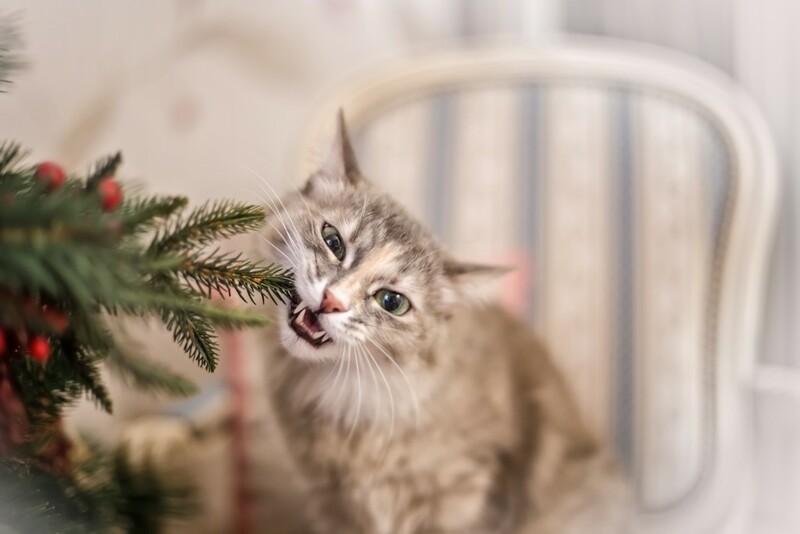 However, Christmas trees can have its share of dangers that you or your cat might not be aware of. 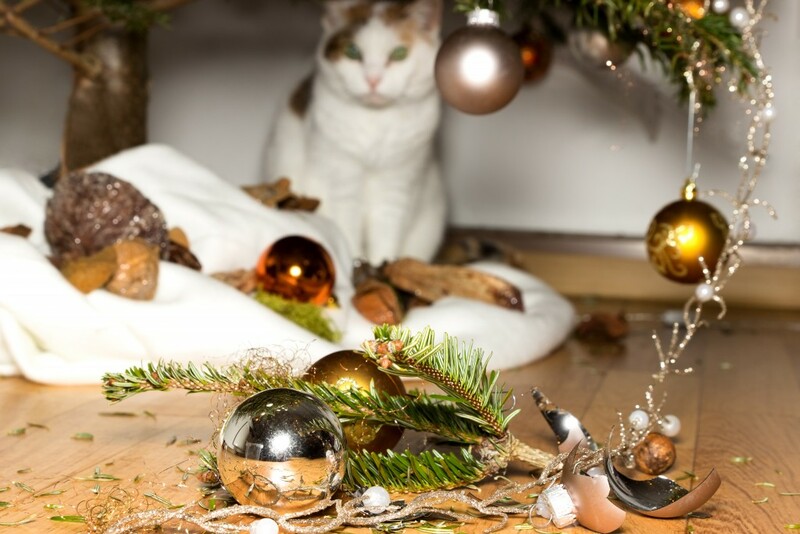 Here are some tips to keep your cat and Christmas tree safe from each other, and create a peaceful and joyous coexistence during the holidays. You have a Christmas tree with lights and other combustible materials. You also have a cat that loves the Christmas tree too. What do you do? Well, the first thing to keep in mind is fire safety. A tree that’s been decorated with ornaments and tinsel garlands and other items (which can include family heirlooms that are decades old) can be a fire risk. It doesn’t take much to knock over a Christmas tree. If it’s near a fireplace or you have frayed electrical wires, well, you can see where this is going. Check the wires for the lights, make sure they’re in good condition, and keep the tree isolated as much as possible. There’s nothing more rewarding than the yearly tradition of putting up ornaments during Christmas time. For many people, it’s a family tradition that they do together. They also have ornaments passed down from their mother and grandmother, many of which are family heirlooms that they cherish. As it happens, however, a lot of old ornaments can also be fragile and brittle. Broken ornaments can pose a choking or cutting risks, for your cat and for the rest of the family, especially if you also have young children (and puppies or kittens). You could try to keep those ornaments higher on the tree, and with a sturdier connection. If they seem too much of a risk, you might want to consider not hanging them up, at least until your children get a little older and/or your cat is no longer intrigued by the Christmas tree. 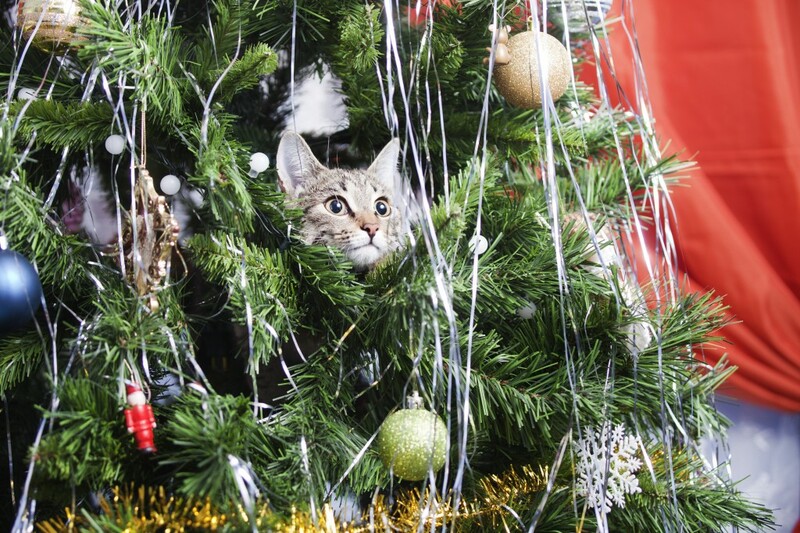 Cats damaging the trees and ornaments is not the only safety concerns during this time of the year. Perhaps far more likely is your cat trying to chew on the pine needles or drink the tree water. Luckily, pine needles and tree water are not that dangerous to your cat. 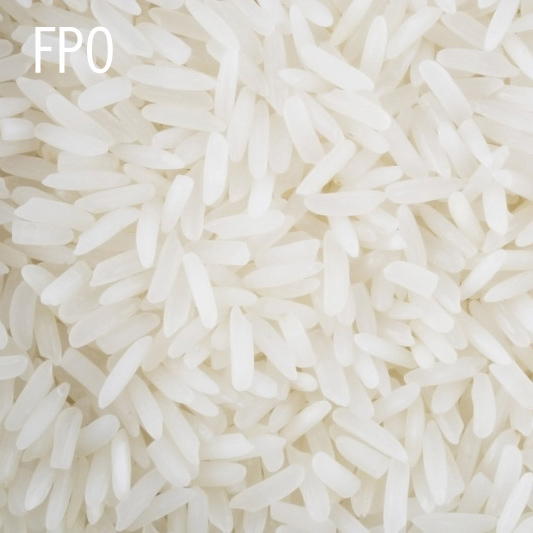 They can cause some stomach irritation if consumed, but generally they’re not toxic if in small amounts. Chances are, your cat isn’t looking at the tree water as a water source; Fifi is probably just curious. Still, you should cover up the base with foil or some other covering so they can’t get access to it. Some trees come with a water base that contain fertilizer or preservatives to keep your tree fresher longer. Those chemicals can potentially be harmful if consumed. As for needles, well, you can’t cover up the whole tree obviously. Instead, try vacuuming up fallen needles that are on the floor to minimize ready access. Some people feel that artificial trees are a good alternative, though plastic needles pose their own issues. This is the favorite holiday season for many people. Children can’t wait to open presents. For adults, it’s a holiday filled with cheer and good will. Christmas trees add to the traditions and happy memories. The best way to preserve that is to keep everyone as safe as possible. The Christmas tree is the symbol of the holiday, and we wouldn’t want that to be the cause of an unfortunate incident. A merry Christmas and a happy New Year can start with something as simple as keeping your furry friends safe from the Christmas tree.